Their peach orchards are located about 10 miles south of where we live. Each year they open the orchards to the public and people can pick their own peaches for a small fee. This year we went in with a friend who picked a 5-gallon bucket of peaches. We paid her for half of them. Peaches are my favorite fruit and we planted 2 peach trees last year. But it will be several years before they produce very many peaches. So, until then I will have to buy them. So, what to do with all these peaches! Well, I ate a good many of them, but that hardly made a dent in them. It has been several years since I canned anything, but I decided it was a good time to dig out my canner and can some peach jam. And what follows is a pictorial account of my jam project. First, buy new jars or look around kitchen cupboards and in the basement to find enough jelly jars for the project. Make sure they are not cracked or chipped and wash them in hot soapy water. Next, get out the rings and lids for the jars. The lids are the flat metal discs. Note that you can save the jar rings and reuse them, but you cannot reuse the lids. Third, buy a package of fruit pectin. There are several varieties, such as Sure-Jell and Ball. These come in powdered and liquid form. I've used both and it seems to me that the powdered kind allows you to use less sugar. Pictured below is a package of the liquid kind because that is what I had on hand. The fruit pectin will contain directions for several kinds of jams and jellies. I like to high-light the the one I am going to make. Fill your canner with water, enough to cover your jars with at least an inch of water, and get it started heating. You want it to be boiling before you fill your jars. Wash the fruit and assemble your tools for peeling. For peaches, you need a pot of boiling water, a bowl of ice water, a pair of tongs and a large bowl to receive the peeled fruit. Drop the peaches into boiling water for about 30 to 45 seconds. Remove them with the tongs and put them in the bowl of ice water. After they have been in the ice water for a few seconds, the peels should slip off easily. Chop them up and put them in the bowl. For peach jam, mash the peaches with a potato masher. The directions may tell you to add lemon juice at this point. It helps to keep the peaches from turning brown. Put the rings and lids for your jars in a pan of water and heat them on the stove. You want to boil them for just a couple of minutes before putting them on the jars. Now, follow the directions that came in the package of fruit pectin for canning them. It will tell you how much sugar to add and when to add the fruit pectin. Usually the directions will tell you to heat the fruit to boiling after you have added the sugar and then spoon it into the clean jars. Wipe the rims of the jars with a damp paper towel before adjusting the lids and rings on the jars. Screw the lids on tightly, but do not over tighten. As you can see, I just used what lids and rings I had on hand for this project .... some white colored, some brass colored. I'll probably save those that have matched lids and rings for Christmas gifts! Now, place the jars in the canner rack and lower the rack into the canner full of boiling water. The boiling water should cover the jars by at least an inch. Once the jars are in the canner replace the lid and bring it back to a boil. Process for the amount of time listed in the directions. After the jars have boiled for the amount of time in the directions, immediately turn off the heat and remove from the canner. Be careful not to burn yourself. I use oven mitts to remove the rack from the hot water. Set it on a cutting board covered with a kitchen towel to keep the hot jars from coming in contact with a cool kitchen counter and breaking. After the jars have cooled a little bit, remove them from the rack and set them on another kitchen towel to cool completely. After the jars are cool, test the lids to make sure they sealed. They will make a popping noise when they seal and the lids will be indented downward. If, when you apply pressure to the lid with your finger, it flexes, then the lid did not seal. You should store these jars in your refrigerator and eat them first. I canned two batches of peach jam and only had one jar that did not seal. Finally, fill your dishwasher with dirty dishes and enjoy your peach jam! 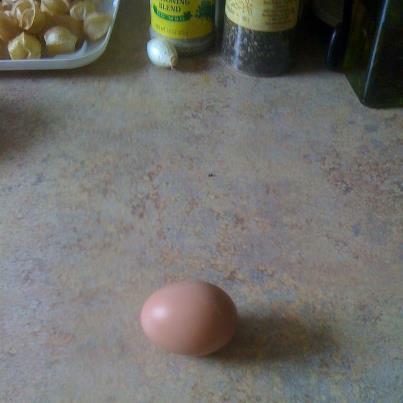 On July 9 I published a picture of the first egg from our chickens. It is now two weeks later and we are consistently getting 1 to 3 eggs a day. We have eaten some of them, but here is a picture of what we have on hand at the moment. Notice the variety in colors and sizes. Most of them are shades of brown, except the 3 smaller ones that are cream color. There is one humongous egg in the paper carton along with a couple of small ones. Most of them are somewhere in between. We've been wondering what time the chickens are laying eggs and which chickens are laying them. So, Tom setup our wildlife camera across from the nest boxes in the chicken coop to see if he could get answers to these questions. Here are some of the pictures we captured along with my own interpretation of what the chickens are thinking. Decisions, decisions, decisions. Which box do I use today? Okay, I think I'll use this one. Ahhh. Finally some peace and quiet. Waiting in line. Would you hurry up! Okay, got that over for another day or two. So, we have one of our questions answered. It is obvious from the time stamps on these pictures that they are laying their eggs in the mornings, usually between 6:30am and 10:00am. However, it is still difficult to tell which chickens these are. Could these all be the same chicken? I don't know. All I can say is the eggs are beautiful, taste wonderful and have a deep yellow, rich yolk. I have to admit that I don't grow a lot of ornamental flowers. Since I still work full-time, I don't have a lot of time left over to spend on the essential chores of weeding, mulching, watering and so forth that any kind of garden needs. So, when rationing my time, I tend to choose working in my herb garden over working in my flower beds. However, this does not keep me from enjoying flowers. There are plenty of them in my herb garden. Here are some of the beautiful flowers I have enjoyed this year. This is what my cilantro looked like when it bloomed this spring. Cilantro does not tolerate hot weather very well and will flower and make seeds as soon as it detects hot weather is coming. The seeds of cilantro are known as "coriander" which has a completely different taste. This is a picture of my fennel that is blooming. This picture was taken several weeks ago. If you look closely in this picture, you can see several black-swallowtail butterfly caterpillars munching away on the foliage. They didn't seem to hurt the plant at all and they have all disappeared now. I assume they have all morphed into butterflies by now and have flown away. These are purple basil plants. They are beautiful plants with their purple foliage and pinkish-white flowers that grow on spikes above the leaves. You can eat this basil and it tastes much like regular Italian basil. It tastes a little sweeter to me. This is one of my favorite plants. Oh MY! Is it hot and dry here! I'm afraid we are headed for a repeat of last summer's heat and drought. Thank goodness it waited a little longer to start this year. I am trying not to think about it. One good thing is that the hot weather does not appear to be slowing down my basil plants. See below. Notice how it is beginning to flower in this picture. That is a "no no" for basil and it is important to clip those flowers off before they go to seed. Otherwise, the basil plants will quit producing leaves and put all their energy into making seed. This gets done on Friday evenings when I harvest it for the farmers' market on Saturday. Here is a picture of my preparation for harvesting. I bought this little stool for Tom for his birthday, but it comes in handy for me too! The seat is padded on both sides. So, if you turn it over, it can be used as a "kneeling" bench. When the basil plants get over grown like this, I generally cut them back pretty severely. In fact, I will cut several inches off the top of the plant, like this. When I get finished with a plant, it looks like this. Believe it or not this plant will regrow to its original size in a week or two. And as long as it is watered, then it should last all summer. So here we are in the middle of July and our tomatoes are in full force. Last year was a terrible year for tomatoes because the weather turned hot so early in the summer that, even though they bloomed profusely, the blooms did not set fruit and hardly anyone at our farmers' market had tomatoes. As a result, I think everyone OVER planted this year and it seems the whole market is flooded with them. In fact, we have had an over-supply and have been selling them wholesale to Nature's Supply which is a small, local whole-foods store located in Stillwater, OK.
We are having a much hotter summer than is good for the garden, though, and we need rain badly. This is taking a toll on our tomatoes. In many cases where the tomatoes are exposed to the sun, they get what we call "sun scald". Here is a picture of what I'm talking about. It is such a shame to find big nice tomatoes damaged like this. However, all is not lost. Usually, the other half of a tomato with this type of damage is still usable. Since we save our best tomatoes to sell, I normally inherit the damaged ones. Here are some that I have sitting on my kitchen counter. We've had tomatoes at almost every meal recently, but some of them are still going to waste. In past years, when I had an over supply of tomatoes, I have canned them. But, I am reluctant to fire up my canner and heat the kitchen up for prolonged periods of time. So, I've been freezing them instead. As it turns out, tomatoes freeze nicely. Here's what you do. 1) Wash and core them. Then, cut out any bad areas. 2) Throw them in a food processor and pulse them a few times. 3) Drain some of the liquid from them. To do this, I line a colander with a thin dish towel. Pour the tomatoes into the colander and let them drain for about 15 minutes. If you wish, you can save this liquid for soup. 4) Put the drained tomatoes into freezer bags and freeze. This is so easy and they work great in chili, soups, spaghetti sauce and just about any recipe that calls for canned tomatoes. And here it is! Isn't it beautiful? This egg was laid yesterday and we found 2 more today. So we are definitely in the egg business now. We seem to have been waiting forever for this event. We've had the chickens about 4 months now. These first eggs are smaller than regular size eggs, but I am told as the chickens get older, their eggs will get bigger too. A few days after Tom built the next boxes, we noticed the wood shavings we use to line the boxes were being disturbed. We never saw a chicken in them, but we would find depressions scooped out in the middle of each box. So, we suspected they were "exploring" the boxes when we were not watching. Friday, I heard one of them squawking up a storm and I dashed out to the chicken coop to see if by chance one of them had laid an egg. Nothing. Then, Sunday afternoon, Tom came in saying he had heard one of them making a lot of noise, too. We joked about how we had always heard that chickens made a lot of noise, clucking, squawking, etc. whenever they laid an egg, but figured that was probably just an "old wive's tale". However, Tom's curiosity got the best of him, went out to check and returned with this little jewel. So, today when he when he heard a commotion coming from the chicken coop, he was hopeful that maybe we'd be lucky enough to find another egg. But, instead of 1 egg, he found 2! We both like eggs, but at this rate we may be inundated once the flock gets this egg-laying thing figured out and goes into high gear! I suspect our dogs may get their dry dog food supplemented with some scrambled eggs occasionally. The hot, dry weather has arrived and with it has come a wave of grasshoppers. I see them everywhere. Unfortunately, they like to eat some of our garden plants. Here is a picture of one of the plants in my herb garden that has been attacked by them. I'm not too upset about them eating this particular plant because it is a medicinal herb called comfrey which I rarely use. Here is a picture of it a few weeks ago when it was in bloom and before the grasshoppers arrived. Like most medicinal herbs, comfrey's medicinal uses have not been supported by modern medical research. But, herbal lore indicates that it is good for skin ailments. The plant contains the small organic molecule allantoin, which is thought to stimulate cell growth and repair while simultaneously depressing inflammation. It is commonly agreed that Comfrey should be restricted to topical use only, and should never be ingested. One traditional use of comfrey is in healing bone fractures, thus its common name "knitbone". But, back to the grasshoppers. They do not seem to be bothering any of the other plants in my herb garden. So, the comfrey appears to be acting as a "trap" plant. In other words, it is attracting the grasshoppers and they prefer to eat it, rather than the other plants in the garden. I'm not worried that they are going to destroy it because comfrey has an aggressive growth habit and really does not seem to be hurting too bad because of the grasshopper damage. I know the chickens like to eat insects, but there are some insects they will NOT eat. For example, they will not eat Potato Bugs. I've heard that this may be because potato bug larvae feed on the leaves of potatoes which are in the nightshade family and have poisonous leaves. So, last week I tried an experiment. I caught a couple of the grasshoppers to see if the chickens would eat them. Here they are right before they were introduced to the chickens. Results of the experiment are that chickens DO like grasshoppers. I had not really planned for this to become a frequent activity for me, but the flock was so delighted over the tasty morsels that I have subsequently found myself catching grasshoppers whenever I can and taking them out to the chicken pen. This has made me very popular with our hens.